The only crop that was ready to be harvested this week in my early spring garden was one I had nothing to do with. When I went out to the garden to check on my sugar-snap peas (they finally germinated! ), imagine my delight when I also discovered a whole bed of chickweed and dead nettle. These delicious and nutritious wild, edible, perennial and ubiquitous greens had taken over a bed of soil that I had not yet planted. What could be better? They grew on their own, with no help from yours truly. I didn’t have to buy seeds, nurture the transplants, weed, feed or fret about this crop. It just took care of itself, and in so doing, it is taking great care of me, too. So I thanked Mother Nature and grabbed up several fistfuls to eat and cook with. I learned about this “manna” from heaven a couple of years ago when I went for a walk with the amazing herbalist and wild foods enthusiast Kim Calhoun, and later took a class with her at Central Carolina Community College. She showed me some of the weeds growing in our backyards that can easily be used in salads, soups and pesto. She also told me that wild greens are packed with nutrients — or “goodiments” as she likes to say. Then she shared her recipe for Wild Greens Pesto, which also features garlic, one of the most nutritious cultivated foods we know. I made my first batch of the season this week and it’s even more delicious than my last batch. It tastes great on sandwiches, pasta, vegetables, seafood, meats, etc. You can keep it in the refrigerator for weeks at a time (if you can manage not to gobble it all at once) and it keeps well in the freezer in individual ice cubes for easy future use. 1. Blend garlic and nuts in food processor until coarsely chopped. 2. Add remainder of ingredients to food processor and blend till desired smoothness. Yields approximately one cup. 3. Eat on crackers, mixed into pasta, smeared on a frittata or fried egg sandwich, spread on rolls or pizza, get creative! 4. Any leftovers will keep in the fridge for a week or more. I like to triple the recipe and freeze some Wild Green Pesto in half pint (8oz.) glass mason jars. Before you pick something to eat, you should be sure you know what it is. Check online for color photos of these greens, or ask a friend who knows. Also be sure it’s growing in an area that is not polluted by chemical pesticides, herbicides or road runoff. Always wash the greens before consuming them, in case any of our four-legged friends “fertilized” them when we weren’t looking. What happens when two sustainable farmers and a chef decide to offer farm-to-fork dining at a biofuels plant in Pittsboro? That’s not a reality TV show pitch. It’s actually what took place on Saturday night when new Piedmont Biofarm co-owners Brett Evans and Will Carmines collaborated with new Chatham Chef Geoff Seelen to host their first hyper-local dinner at the Piedmont Biofuels Eco-Industrial campus on the edge of town. Their synergy warmed our hearts and bellies, and ignited a unique locavore pop-up dining series that is sure to succeed. Tickets for the first Piedmont Biofarm-to-Table Dinner sold out in two days. Some 30 guests paid $30 each to enjoy a tantalizing four-course meal in an impromptu festive dining space, just steps away from the vegetable beds that produced fresh ingredients even in mid-winter. Just before dinner, we also got a chance to sample spirits infused with seasonal ingredients, at another fairly new venture, Fair Game Beverage, “Pittsboro’s only legal distillery.” Like the Biofarm, the distillery is also based at the Eco-Industrial Complex. With a farm, distillery, kitchen, swing space and great parking on site, the complex is an ideal setting for community gatherings. The seeds for the dinner series were first planted when Chef Geoff moved to Chatham from New York, where he had been working in the renowned Blue Hill restaurants. Will and Brett are excited to be carrying forward the sustainable ag vision of Doug Jones, who founded the Biofarm. He mentored his two former interns to take over the farm when he was ready to spend more time on other ventures, including cross-breeding new varieties of Pittsboro peppers. Now the Biofarm continues to successfully produce an abundant variety of vegetables with no synthetic chemical inputs. Saturday’s first course was a tasty mixed-greens salad featuring chard, Brussel sprout leaves, and radishes. That was followed by a lovely small plate of mini-crepes made with four varieties of roasted sweet potatoes drizzled with a squash-based sauce. The main attraction was Chatham rabbit (from Fatty Owl Farm) — white meat cooked tenderly and served over a bed of warm greens and sun chokes, flavored by a rabbit-liver-based sauce enhanced with a Fair Game port. Yum. We cleaned our plates. 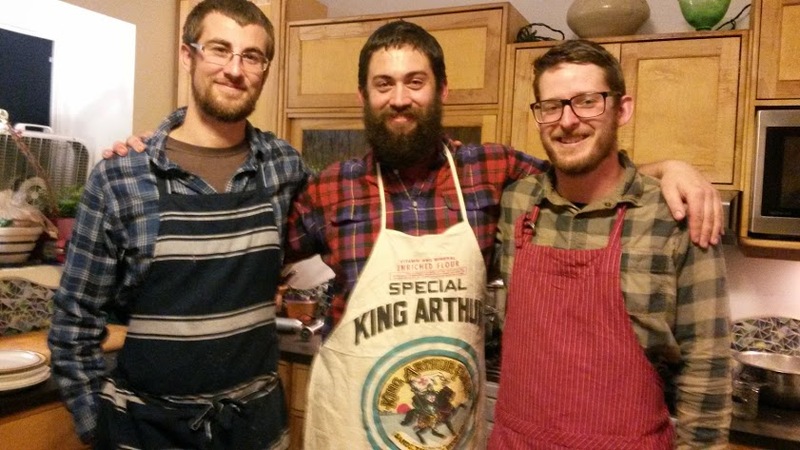 Geoff, Brett and Will decided to make their first dinner especially challenging by presenting it in January, the most difficult month for food production. They made it look easy, except for dessert. (No summer peaches or blueberries to fall back on.) They came up with a frozen dairy ice, topped with pulverized acorns and black walnuts harvested “right out back,” said Geoff. I enjoyed the creative and no doubt labor-intensive use of wild ingredients, but kept thinking a splash of warm Fair Game brandy might have taken it up just a notch on this cold night. We’re glad they are ready to continue the series, perhaps monthly, though they expect to raise the price a bit, so that wait staff can be paid instead of working just for tips. Sounds reasonable, as long as it doesn’t get too pricey for eclectic locavores, whose enthusiasm at this dinner was almost as essential to the experience as the menu. Seated at our end of the table were a young furniture craftsman who also plays classical piano, a future elementary school teacher, a massage therapist, a “slow money” advocate and a potter. We had plenty to talk about between bites, and that was half the fun. Many thanks to Geoff, Brett, Will, Abundance NC, Fair Game Beverage and all who contributed to a special night out in PBO. We look forward to more. Michael Pollan may need to slightly revise his eater’s manifesto. How about: “Eat food. Not too much. Mostly wild plants.” Or at least wilder than what you find in most super market vegetable bins. If we want the most nutritional bang for our bucks, we should walk on the wilder side, according to Jo Robinson, opining in The New York Times. The author of Eating on the Wild Side says that most of today’s vegetables (like that sweet corn you’ve been day dreaming about) don’t have nearly as much nutritional power as heirloom varieties do. That means purple potatoes are better than the usual white Idahos. Those bright orange carrots I happily chomp down most days are indeed very good for me. But apparently they don’t have nearly as many nutrients as the heirloom purple ones at the Farmer’s Market and local co-op. Turns out, the Big Food folks have managed to breed much of the nutrition out of everyday tomatoes, corn, carrots, and other mass produced produce. Eating those veggies is better than gobbling potato chips for sure, but if you want maximum nutrition, it’s time to get picky. The good news is, this doesn’t have to be complicated, or costly. Weeds like chickweed, dandelions and nettles that propagate freely all over my yard, are packed with nutritional power. And herbs, any herbs, are also densely nutritious. If you think parsley is just a throw-away garnish, think again. 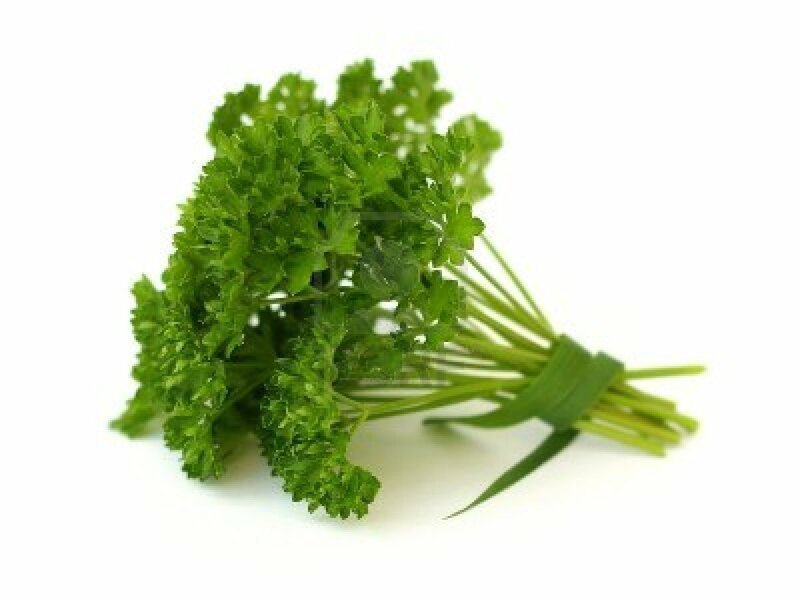 It’s easy to grow parsley or find it fresh in the market, and if you just add it to everything you eat, you’ve got maximum nutrition with little effort. Select corn with deep yellow kernels. Cook with blue, red or purple cornmeal. Choose arugula over iceberg lettuce (that’s a no brainer). Scallions or green onions are more nutritional than the white or yellow kind, and wild onions are the most nutritional of all. Herbs are wild plants, too even though you can cultivate them in your garden. Adding herbs like parsley and basil not only add flavor, they add nutrients. Last Sunday at the first Wild Food and Herb Market in Carrboro I learned from the amazing Kim Calhoun that some of those weeds proliferating in my yard and garden are both delicious and nutritious. Freebies from Mother Nature. 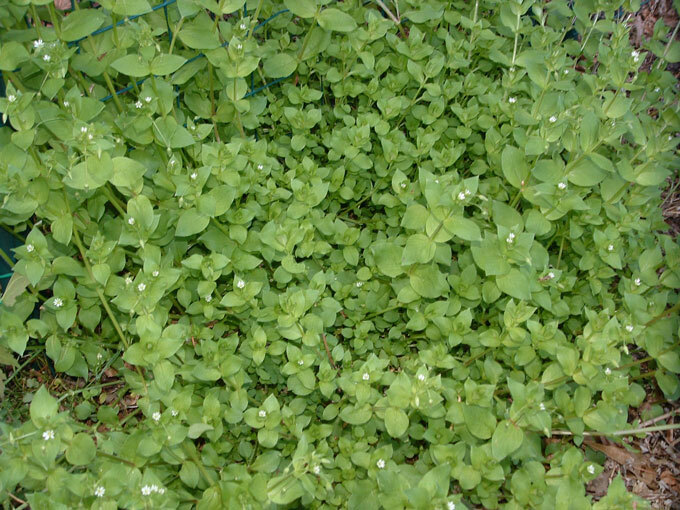 I had heard that chickweed made great pesto, but that seemed too good to be true. During a short walk on the wild side, Kim validated the chickweed story and gave me a whole new perspective on the bounty growing all around us. She showed us the familiar chickweed, dandelion and speedwell thriving just a few steps away, confirming that chickweed and dandelion are great for salad and pesto, and speedwell has medicinal properties. It’s important to properly identify plants before consuming them, Kim said (a magnifying glass and illustrated guide are useful tools). Avoid areas that may have been treated with pesticides or harmed by roadway run-off or other toxic substances. And, before harvesting, be sure to thank the plant and don’t pluck more than you need. A week later, I got down on my knees in my garden patch to thank and pluck three cups of the chickweed that had proliferated there since I harvested my sweet potatoes in the fall. A few minutes later, I was savoring the fantastic Chickweed Pesto I made from Kim’s recipe, reprinted below with her permission. If you want to learn more about edible wild foods and herbs, I recommend that you connect with Kim and consider signing up for her March 24 “eat wild spring” workshop at the N.C. Botanical Garden, where you’ll get to forage and make wild greens pesto. ECO: Why buy local? Why buy organic?